No. 1 in D Minor, No. 2 in F major and No. 3 in C Major, complete set. Set of three, facsimile of ca. 1811 edition (parts only) and modern performing edition, score and parts. Antoine (Anton): Kraft (1749-1820) was a cellist in Haydn’s Esterhazy orchestra from 1778-90 and Beethoven wrote his Triple Concerto for Kraft. 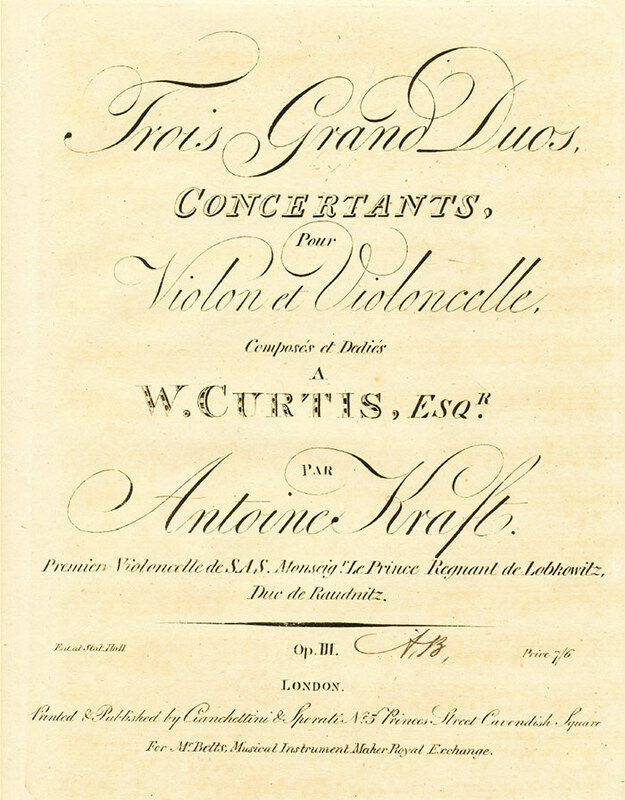 The 3 Grand Duos of Opus 3 were probably first published in 1792. The first movement of No. 1 in D Minor is in sonata form with slow introduction, and the three-part second movement is a Cantabile Adagio, a Recitative for the violin, and a Rondo closing. The first movement of No. 2 in F Major is in sonata form, while the slow second movement leads directly to the Rondo third movement and has a pseudo-cadenza for the cello. There are some challenging passages in treble clef for the cello throughout this duo. The first movement of No. 3 in C Major is in sonata form with no slow introduction. The slow second movement is in the key of E major and the Rondo third movement features “sul G” for the violin, “ponticello” in the cello, etc. There are some challenging passages in treble clef for the cello throughout this duo. I found a YouTube video of the first movement but not from my edition. Note that they are playing from the facsimile, not my edition.